Prrrt is a game by Bruno Cathala and Ludovic Maublanc – the same team that brought us the superb Mow (also by the same publisher and artist). 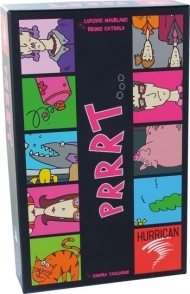 Prrrt definitely has a unique theme as players are aiming to take the least shame for farting in an enclosed space. Yes, you read that right. The game consists of 3 types of cards – shame, smell and location. Each incident, a location is drawn which determines the direction of play and the starting number of shame cards. The game ends when there has been at least 1 incident in each location (so from 5 to 9 incidents) and the player with the highest total value on their shame cards loses.